IZMIR PROVINCE, Turkey — As the sun set on a hot Saturday at Marika Beach Club in the popular seaside town of Urla less than 30 miles from Izmir in western Turkey, Rabia Arslan finally decided to call it a day. 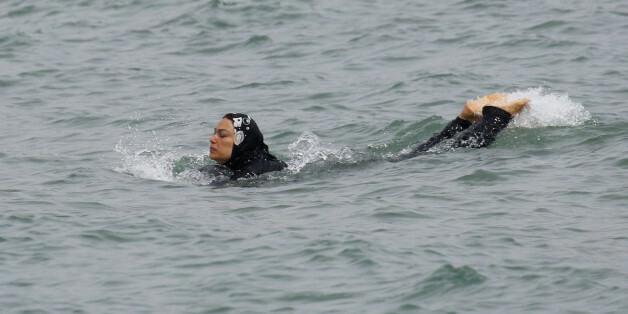 Donning a purple “hashema,” the conservative swimwear that covers the body and the head, also known as the “burkini,” the 30-year-old mother of two had been determined to make the most of her day at the beach. Had Arslan been in Côte d’Azur, the cooling swim she enjoyed here with her young children would have been out of reach. Last week, a number of French municipalities, including the town of Cannes, banned the burkini from their beaches. The French ban argues that burkinis are provocative symbols of Islam and fall against the secularism principle guaranteed by the French constitution. With historical ties to France, Turks are divided in their opinions of the burkini both in France and in their own country. When it was founded in 1923, the Turkish Republic adopted a constitution echoing the secularism of the French, which ensures separation of religious affairs from those of the state. The French term for legal secularism, laïcité, was regarded as extremely precious in Turkey’s road to modernity throughout the 20th century. In line with this model, headscarves were banned from public institutions such as government offices and universities. This approach to secularism contrasts with the model seen in the United States and the United Kingdom, which tends to respect religious freedom rather than seek to minimize it — at least until recently, before Donald Trump came up with the plan to ban Muslims entering the country. As Turkey grew more democratic and as religious minorities became the majority, conservative Turks began to demand equal rights in public space. The Justice and Development Party, or AKP, government came to power 14 years ago with the promise of lifting the longstanding ban on headscarves in public institutions, which they eventually did in 2013. Today, the wives of Turkish President Recep Tayyip Erdoğan and Prime Minister Binali Yıldırım, the top two officers in the country, both have been known to wear headscarves. With historical ties to France, Turks are divided over their opinions of the burkini both in France and in their own country. In Çınar Pilgrimage Store in the busy Kemeraltı shopping district of Izmir, hashemas start from as little as $13 for a decent piece. A young saleswoman there says they sell out of most sizes of the swimwear at the very beginning of summer season. But the popularity of the hashema does not speak to a larger trend of veiled women in Turkey. In fact, there are many Turkish families in which headscarf-wearing members live side by side with their unveiled relatives. My own sister-in-law wears a headscarf, while her three sisters and I do not. In that respect, parts of Turkish society are fairly progressive, especially here close to Izmir. The opinions on the veil in Turkey, like the burkini, are quite diverse. According to a 2014 survey from the University of Michigan’s Institute for Social Research, while at least 50 percent of Turks prefer a woman to cover her hair in public, 52 percent of Turks surveyed also state that in the end, women should be able to decide for themselves what to wear. 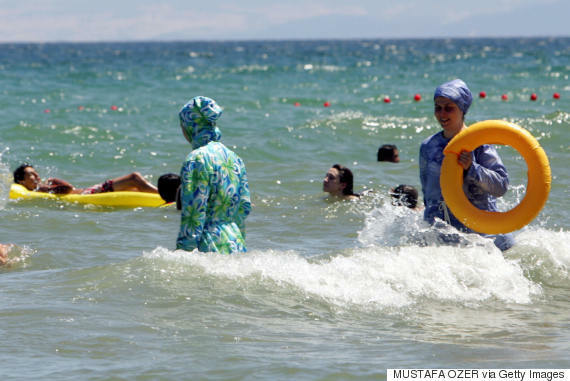 It seems unlikely for Turkey to expect a burkini ban like France’s. In many cases, the attire is seen as a natural extension of the headscarf, the fight over which was fought and won by the Islamist government. Although not as hotly debated as the headscarf years ago, the burkini is also known to have prompted some cultural debate in Turkey. As such, the people I talked with on the beaches of a town in western Turkey were similarly divided in their opinion on the French banning it. As I interviewed both Turkish liberals and conservatives on the beach in Urla, this divide became clear. Some said they aren’t so surprised and may even be supporting the burkini ban on French beaches. Others are angered by it and by what they perceive as the clear lack of tolerance towards other religions. Urla is a resort town near İzmir, the third largest city in Turkey. Its residents support separating religion from the state like Atatürk intended, to the extent that they boast about calling their hometown “the infidel İzmir.” Unlike most of central Anatolia, which tends to be more conservative and strongly support the AKP, İzmir has always had fairly liberal views. It was on my first day of interviews in Urla that I met Arslan and her family, who provided similarly divided opinions. “This is a Muslim country and we must live according to our religion,” Arslan, who was the only woman I saw wearing a hashema, said of her right to wear the garment. But her brother, Bekir Gündüz, 31, isn’t as supportive of her strong rhetoric. He said an individual cannot be forced to wear (or not to wear) a particular piece of garment. His wife doesn’t wear the headscarf or the burkini. “As long as what she wears is modest and doesn’t bother me or others, I’m fine with it,” he said. “Europe is the birthplace of Renaissance and reform, and yet it denies someone her freedom to wear whatever she wants to the beach,” Gündüz added. 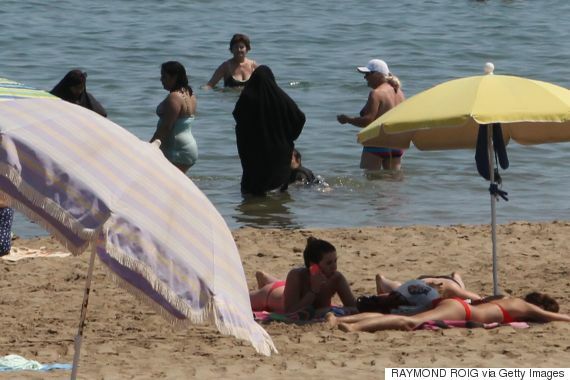 But while they discuss the social implications of swimwear, the brother-sister pair suspect an ulterior motive behind burkini ban in French beaches and blame growing Islamophobia in the West for it. Gündüz said he feels that Europe is determined to prevent the spread of Muslim culture by measures like this latest burkini ban. Meanwhile, at İzmir’s offices of Religious Affairs Directorate, located on the same street as the hashema store, imam Osman Üst answers phone calls from the public on everyday religious issues. In between counseling a man who regretted his decision to divorce his wife, and another one asking advice on how to pray during a long bus ride, Üst told me that, “any kind of ban is purely ideological,” noting that he believes Islam requires women to cover every part of the body other than their face and hands when outside of their homes. When I returned to the beaches of Urla for a second day of interviews, there were only a handful of women wearing hashemas on the overcrowded beach, many of whom congregated towards the back. It seems that since the lifting of the headscarf ban and other developments during Islamist AKP government’s rule, the roles have been reversed. It is now secular Turks who tell me of their fear of being unable to live in accordance with their liberal beliefs — a common concern shared by the burkini-banning French politicians. But this is not a problem on the secular beaches of Urla. From the beaches of Urla, it seems that, at least in this part of Turkey, a ban on burkinis is not expected anytime soon. There are, however, people here who are not as happy about the swimwear as others. It seems that on this beach, neither liberals nor conservatives feel comfortable in each other’s presence. A young psychologist and mother of two in her 30s (who asked not to be identified out of fear of reprisal), told me that in principle she supported individual freedoms of religious people and of the lifting of the headscarf ban when it was first proposed. But as Turkish society became more polarized and liberals like her felt threatened, the mood has changed. “I don’t share [the conservative] mentality and don’t find burkini aesthetic. I wouldn’t want to go to the same beach with them,” she said. Some on the beach went so far as to disassociate the burkini from Islam all together. Osman Öncü, a 51-year-old Turkish club owner from Bremen, Germany, was visiting the beach with his 61-year-old German partner, Barbara Stanschus. It seems that on this beach, neither liberals nor conservatives feel comfortable in each other’s presence. Talking to both, I felt as if each side wished the other were invisible. A less than ideal solution to ease this tension is allocating women-only or segregated beaches exclusively to burkini wearers. Some resorts in Turkey already have specially designated sections for males and females, an addition to Turkish tourism that has sparked debate, with some arguing that it represents an increasing divergence from the separation of religion and state. As summer draws to an end, it is unlikely that segregated beaches will become more widespread here in Urla, but the burkini ban controversy is likely to spread and continue to divide people not only in France, but also throughout various cultures and countries, just as it has in Turkey.